In today’s turbulent economy, you do not have to flip houses or spend large sums of money for someone else’s “guaranteed” methods of making money. The book “Money: How to see It, Get It, and Keep It” offers you tips and strategies which are time-proven and life-changing. What’s unique about the book is that it gives you both practical information on how to maximize the flow of money as well as priceless tips on how to survive in uncertain times. 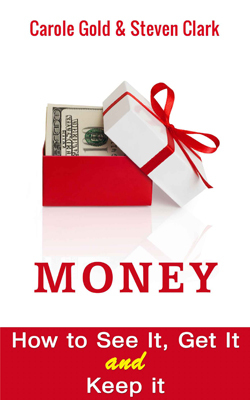 You can’t go wrong as the book was written to help readers create a healthy relationship with money… while making more out of the money they have for both themselves and those they love. By way of guiding principles and sharing their deeply personal stories, Carole Gold and Steve Clark help their readers determine what they want out of life, how to create a plan of action that really works, and how to develop the habit of winning. An added bonus are the insights into how to implement the discipline to put it all together. The book is comprised of 27 proven methods that can put more cash in your pocket in a way that aligns with the Universal flow of energy…since money is a form of energy. For each of the 27 steps, you get 1) the authors’ real experiences; 2) the cause underlying the problem, and 3) the practical solution that also shows you how to proceed should you find yourself facing a similar situation. You’ll learn the real scoop on how to view and succeed in all aspects of your life from the moment you start your day until its end. The book is a fast, fun read with practical and often remarkable insights. This book is easily understood and packed with no-nonsense advice. Step-by-step you’ll realize how to manage your life towards success. You can use this as a practical guide and a secret weapon in more ways than you can imagine. The book “Money: How to see it, Get it, Keep it” is about so much more than money. It’s a new way of looking at, and moving beyond, obstacles to abundance. This one’s for you!